Exploiting an Eidos exclusive patent, based on the use of a double ribbon, a positive image can be created electronically on the thermal transfer ribbon in an initial print phase and then transferred “hot” (using pads or heated rollers) to the object to be marked. CODITHERM permits extremely versatile, high quality marking of production batches with texts, bar-codes and variable logos. Marking, directly on the production line, means that the product can be personalized during packaging, thus avoiding the need for a large stock of preprinted parts. 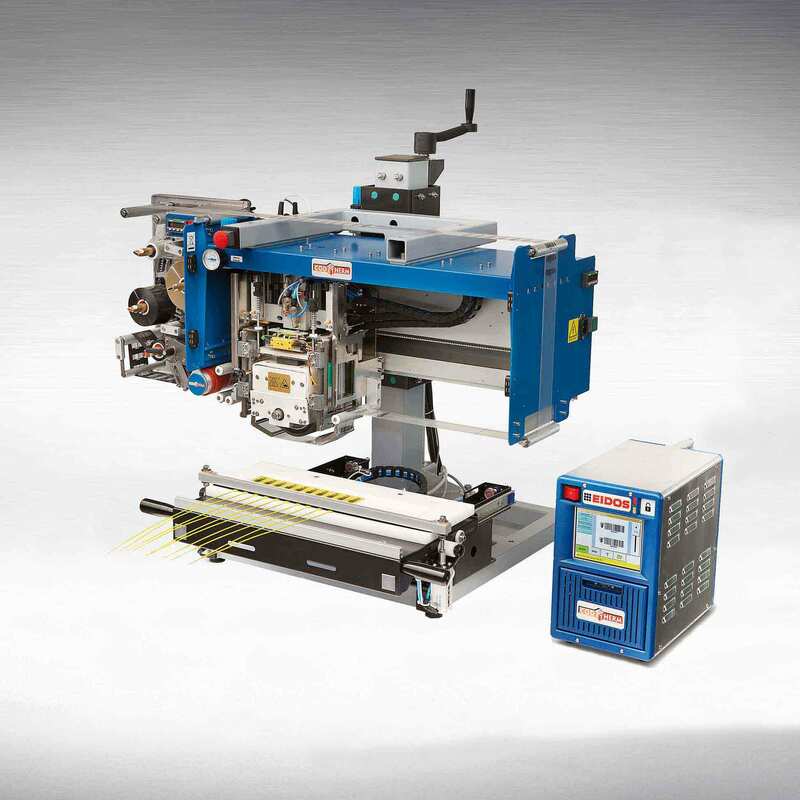 The interactive colour graphic display simplifies the operation of locally changing data end enables the on-line control of what the machine is printing. Print Speed: up to 100 mm/sec. a Thermal Transfer Module (chosen from an array of various models according to the application). CODITHERM 4 can print on ribbon up to 95 mm wide. The tension of each ribbon is controlled to ensure better imagine positioning stability. “Corner-Edge” printing edge, 107 mm, with 12 dot/mm (300 dpi) definition. Very high definition 24 dots/mm (600 dpi) resolution head is available. Use of specific Thermal Ribbons required (Inked Ribbon + Receptor Ribbon). Tape roller length = 500 m.
Maximum printing area: according to transfer type. Touchscreen 5.7” graphic colour display. Ink- and Receptor Ribbons in 500 m length. Big range for different applications.